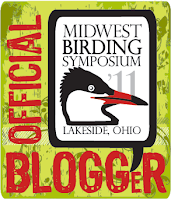 I arrived in Lakeside, Ohio at about 7:30pm...and it was like a ghost town, but decorated nicely with Midwest Birding Symposium signage. You see, just about everyone was on the sunset cruise. I had missed it. Bummer. Nancy Castillo, the Zen Birdfeeder was in the Hoover Audutorium where I checked in, so it was cool to meet her, but after that, people were few and far between. I was hungry, cold, and alone in a foreign land. I grabbed a Subway sandwich and got settled into my digs at the WoHoMis Lodge right across from the Wesley Lodge which will host the official bloggers at the Den of Blogniquity. Fortunately, my dorm room is close enough to get the free wi-fi from the Wesley Lodge. When I got online and I saw Kelly Riccetti of Red and the Peanut had just updated her her blog from the Lakeside Hotel lobby, I decided I'd head down that way to meet her and to see all the action of the people returning from the cruise. I'm glad I did! While walking I met Marie Read and John T. Moore on the street. As soon as I walked into the hotel I recognized Kelly - who is super fun to talk with. She was chatting with Uncle Frank and Rob Ripma of NuttyBirder.com. I got to shake hands with two of my birding heroes Jim McCormac and, John C. Robinson. Nina Harfmann of Nature Remains was there in the lobby too. Then Greg Miller comes walking in and hung out with us for a good while sharing stories, birding tips, trivia, and even ring-tones. Awesome! Well, off to bed so I can get up early and see the warblers at Magee Marsh at sunrise!!! Hi Rob!! I just found a few minutes to hop online. I'm so glad you stopped by last night! I had so much fun talking with you, the other Rob, Uncle Frank, Greg...and everyone!! I'm glad I didn't make it on the cruise! !